Americanized Chinese foods would rarely be recognized by the Chinese as authentic. Especially Springfield-style cashew chicken. When Chef David Leong moved to the United States from China in 1940, it was difficult to find foods from his homeland that would be accepted by the local residents. He created Springfield Style Cashew Chicken while working at the Grove Supper Club in Springfield, Missouri. Chef David Leongs famous cashew chicken recipe was so popular he was able to open Leong’s Tea House in Springfield. Cooks recognize that this Springfield Missouri specialty is simply another version of a Southern favorite: fried chicken. 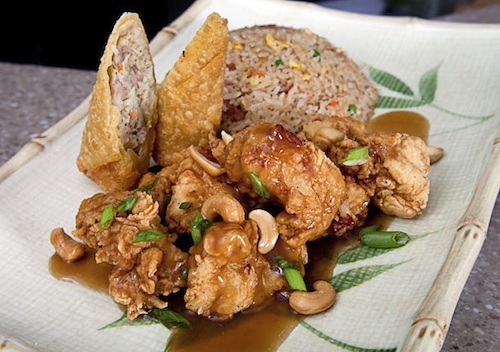 A plate of Springfield-style (deep fried) cashew chicken usually comes with fried or steamed rice instead. Springfield-style cashew chicken served with egg roll and fried rice at Leongs Asian Diner in Springfield MO. photo by Springfield Visitors Bureau. Local folks love fried chicken. So, Leong’s combination of fried chicken chunks covered with Chinese oyster sauce, sprinkled with cashews and chopped green onions quickly became a local favorite. Word spread about the Springfield-style cashew chicken. Today, you can find it on the menu in some Kansas City and St Louis restaurants. There are even several non Chinese restaurants in the Springfield metropolitan area that serve Springfield-style cashew chicken. The New York Times even flew into town to write a story about Springfield-style cashew chicken. Leong’s Tea House closed its doors in 1997, but this carryout favorite is still served at over 70 Chinese restaurants in Springfield. 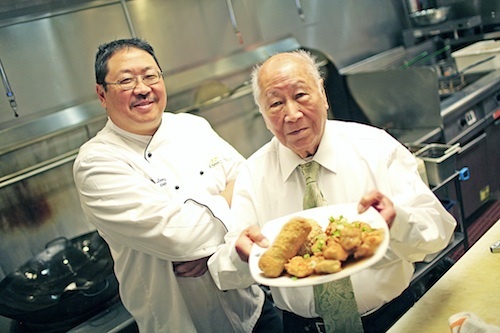 In 2010, Mr. Leong’s son, Chef Wing Yee opened a new restaurant in Springfield serving cashew chicken. 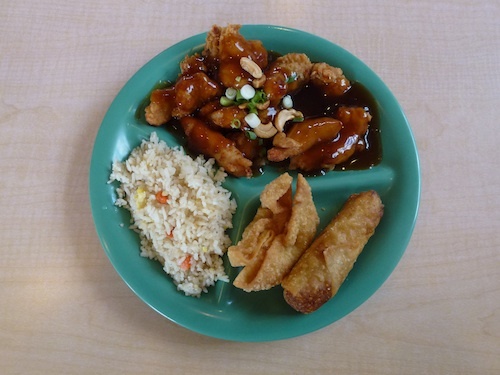 Leong’s Asian Diner is now home of the original Springfield-style cashew chicken. Not all cashew chicken is the same. Eating here can transport you back to the days of Leong’s Tea House. This is the dish by which all Springfield-style cashew chicken should be judged. When you visit Springfield, stop by any Chinese restaurant to try this specialty. Pay a bit more and you can have all white meat chicken chunks. Another Springfield Chinese restaurant that has a wall filled with awards is Chinese Chef. There are specials and a happy hour every day. Of course, they have the mandatory cashew chicken and sweet and sour chicken. Both dishes have deep fried white meat chicken chunks. Notable at Chinese Chef is the eating outdoors option, a rarity in the typically small Chinese drive through restaurants in Springfield. 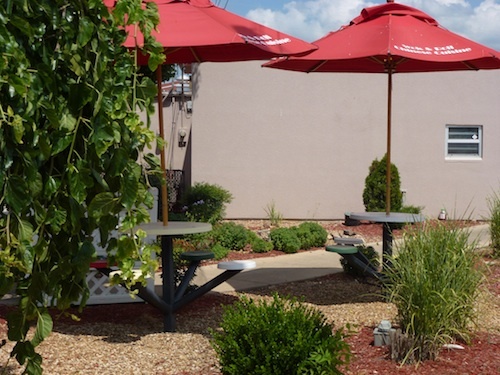 Eating outside is a pleasant option at this beautifully landscaped site. Enjoy your meal at one of theshaded, umbrella-topped tables in the back of the restaurant. Chinese Chef, 3029 S. Campbell Ave. Springfield, MO – 65807. Phone: (417) 883-4770. Hours: Sun-Thu 11am-10pm, Fri-Sat 11am-11pm No web site, no business card, no carryout menu; Chinese Chef thrives because of it’s good, affordable food in a great location. Cashew chicken meal with fried rice, rangoon and eggroll lunch special at Chines Chef. photo by PBH. The good news about all these fried chicken pieces in the cashew chicken is that these white meat chunks are almost always better than the mystery pieces found in “chicken nuggets” at other restaurants. Where to stay in Springfield – My favorite overnight accommodations at mid range prices. Greenstay Hotel & Suites, award winning environmentally conscious hotel. Free internet, comfortable beds, very clean, tasty breakfast, good value. Greenstay Hotel & Suites, 222 North Ingram Mill Road, Springfield, MO 65802 Located at the intersection of Chestnut Expressway and Hwy 65 at 222 N. Ingram Mill Rd, Toll free: 877-284-1251, Phone: 417-863-1440, Fax 417-863-2215 Read more Striped Pot about Greenstay Hotel. Hilton Garden Inn is Missouri’s first hotel designed with sustainable features in the hotel such as a salt water swimming pool, solar panels to generate electricity, a solar reflective roof, high efficiency electrical and water fixtures, full recycling and waste food composting system. 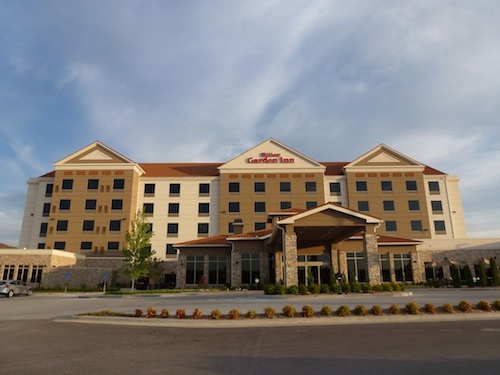 The Hilton Garden Inn Springfield hotel in Missouri is at Republic Road, just off of I-60, adjacent to the medical mile and Springfield’s southside business corridor. Hilton Garden Inn, 4155 South Nature Center Way, Springfield, Missouri, USA 65804, Tel: 1-417-875-8800, Fax: 1-417-875-8801 Read more Striped Pot about Hilton Garden Inn. Visitor Information Center, 815 E. Saint Louis St., Suite 100, Springfield, MO 65806. Travelers should always stop by for maps, discounts, clean restrooms, the latest on current shows, events and activities.